Hi Everyone, hope you've had a good week and are having some fun this weekend. I finally made a decision about Runners for the Master Bedroom and the hallway here next to my office and Hubbs'. I went back and forth, but in the end I didn't feel like I wanted a black rug for the hall; I needed something that was lighter, but on the same scale, and wool like the other's I had ordered last Fall before we moved in. I needed the colors to coordinate, and I was hoping some taupes and grays would match instead of trying to go ivory or tan. It's not a long hall so the 2x8 size worked. I could have used a 2x9, but anything bigger would be too long. 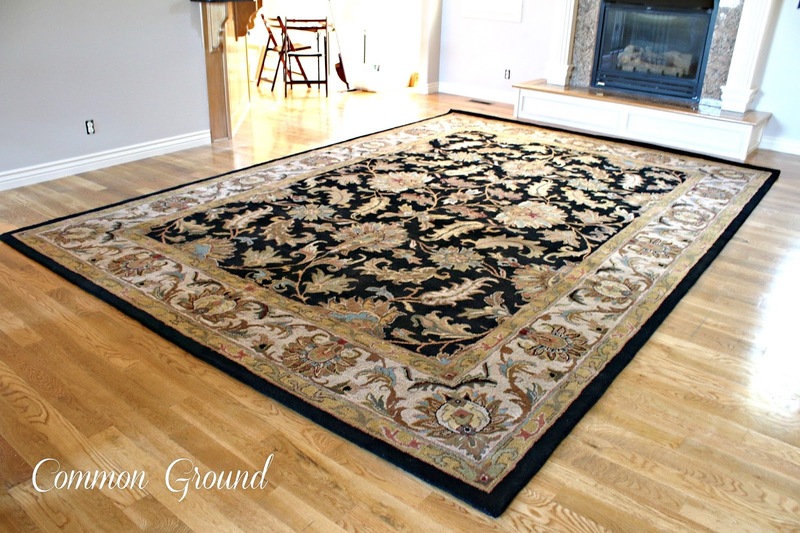 I ordered my other rugs for the living areas, entry, and dining room from Overstock and they did not disappoint. The pattern was a little larger than I had expected, but I've gotten used to it, and now love having a bold pattern to decorate off of. The Living Room rug is a 9x12, and many stores don't have one that large. still look good with the larger print rug. Leopard is "the new black". and I think they compliment each other in style and color. they have a little red and the other ones don't. but you can order yours without. Love your new rugs!! They really look nice in your home!! 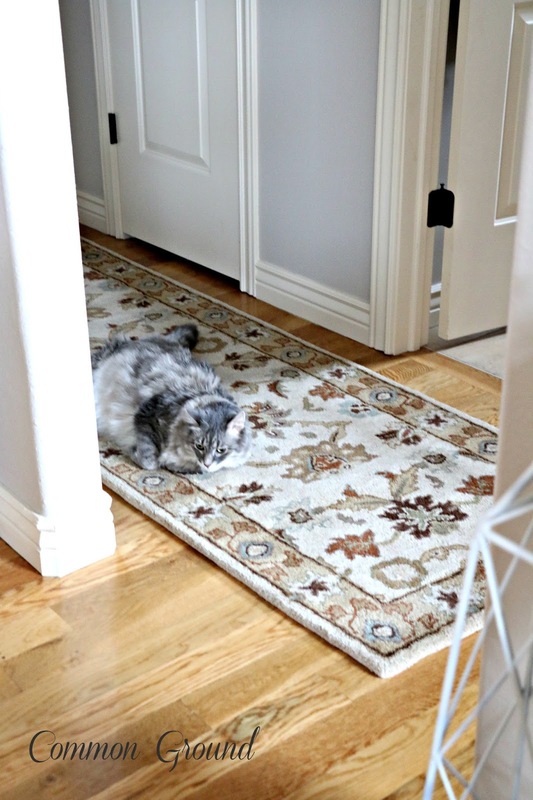 I like the hallway rug, against the walls and adjacent to the larger rug, which I also like! Love your new rugs, Debra! I did one similar to your black one in my living room, too. I still love it. LOL at your cat - at least you know she likes the new runner! My rugs come with a cat too and usually barf. 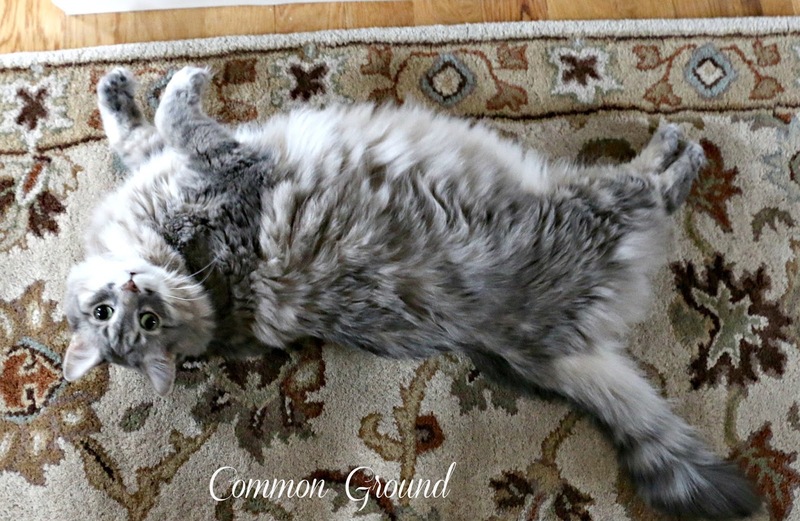 ;) It cracks me up that cats just gravitate to a new rug. 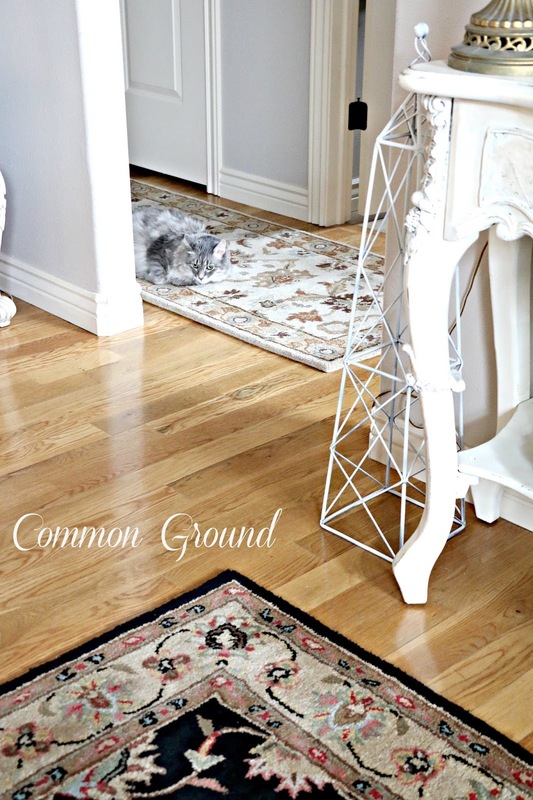 The rugs in the hall and living coordinate beautifully. ha ha, you're right! I got a runner just like this one for the traffic area in our bedroom. Our new carpet is sort of a frieze and the new runner is in the barf zone. It cleans up super easy, and is the right color to camo it! 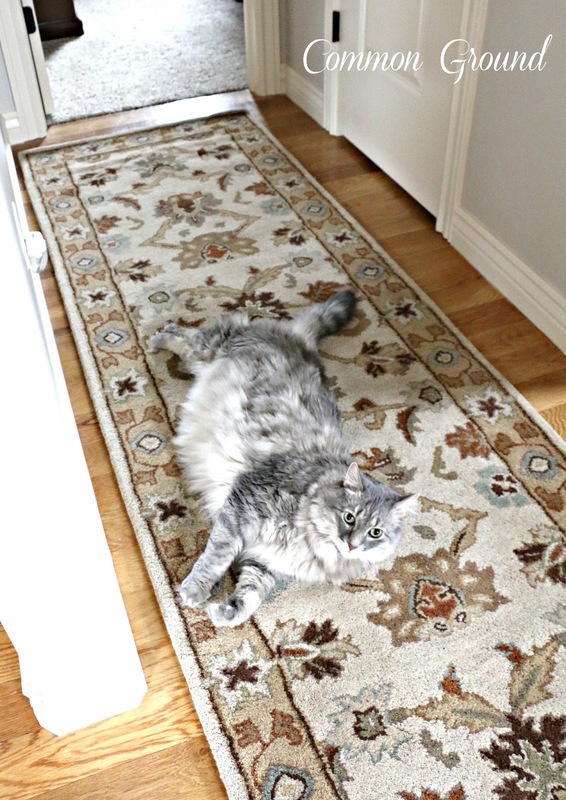 I love the new rugs and the cat too! Love both rugs, they look wonderful. Love that cat!!! And she poses so well for the camera!! I ordered one for the living room, but it is coming with a schnauzer. The bedroom one came with dust bunnies! The new runner is perfect Debra and your photo bomber is adorable!! Love the rugs! 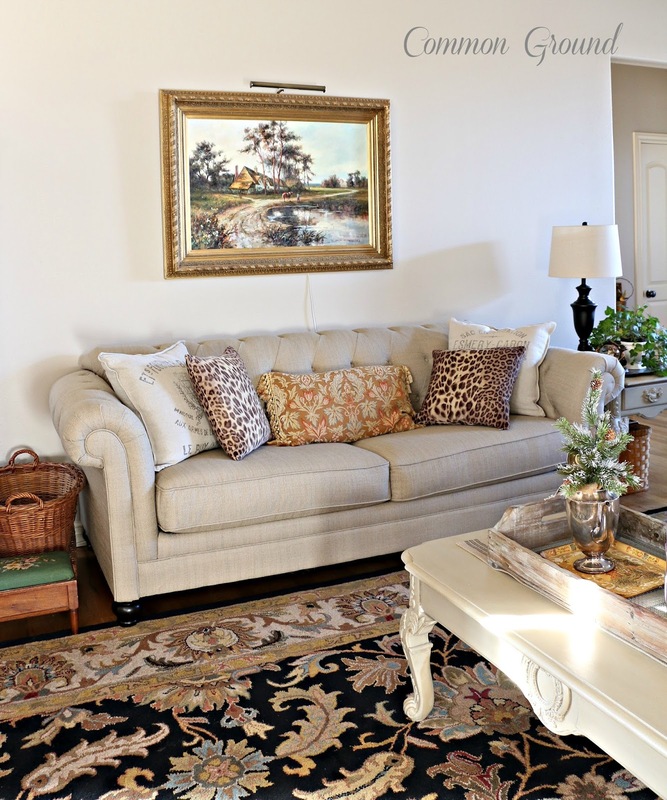 That black one in the living room is gorgeous and coordinates well with the runner! I think the cat approves too:) Enjoy your weekend dear Debra, HUGS! If the cats like them, I guess they're keepers! Love the new hall rug so pretty. Even cuter with your kitty. Isn't if funny how dogs in my case and cats for you are like magnets the minute you put a new rug down. Too sweet. Looks fabulous. What a great deal, rugs and a sweet kitty! Love your rugs...especially the black one. Would you mind sharing the brand and style name? Great choices for your lovely home! I love the runner in the hallway! Good choice! the cat loves it, and that is the most important thing! Well your kitty certainly approves. Lovely classic designs. It's very similar in pattern to our family room rug that I loved but unfortunately so did our new at the time puppy who chewed the wool off in big sections. I miss it. You picked some very good looking wool rugs. I'd buy one with cat since I love cats so. I'm sure you've notice as soon as you bring in something new they just have to put their scent on it! All your rugs are gorgeous, dear friend!!! BUT, I'd love ordering one with "cat to go"!!! he he! Seeing your pretty rugs with your cat adorning them reminded me of one of my favorite calenders featuring the art work of Leslie Ann Ivory. Are you familiar? I know you'd be in love with her art Debra! thanks so much for reminding me of Leslie's wonderful cat illustrations, I used to have several of her calenders, I just did a google search for her, and I'd forgotten how lifelike her work is. I'm a kitty lover from waaaaaay back! 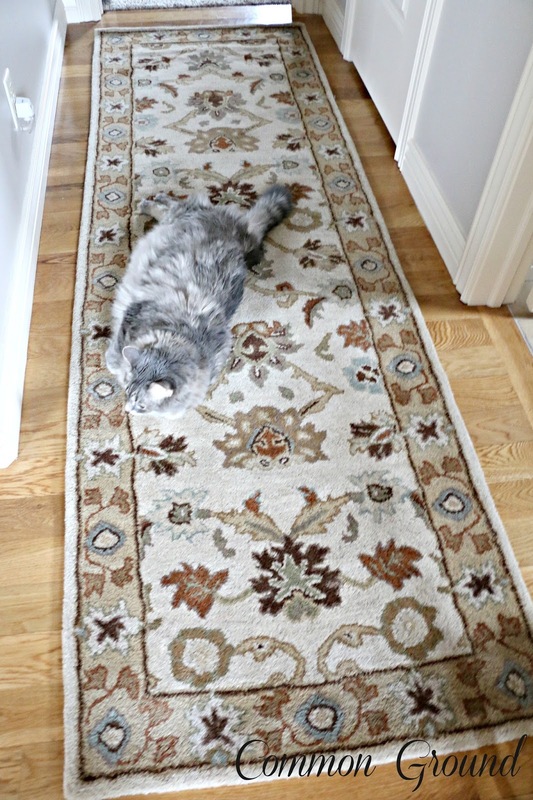 They are beautiful rugs...kitties too! Like your hallway rug. Do you mind telling me where it is from? Tried to see if it was mentioned but couldn't find it.